At Fixing Feet Institute, we are dedicated to providing effective treatment so you can put foot pain in the rearview mirror and get back to your favorite activities. There are many different ways we can resolve your problem, including using our MLS (multi-wave lock system) laser for various conditions. Once a matter of science fiction, lasers have become incredibly beneficial (and almost commonplace even) in the field of medicine. Vision correction, surgery, and fungal toenail treatment are some examples of the many areas where doctors are using this advanced technology. 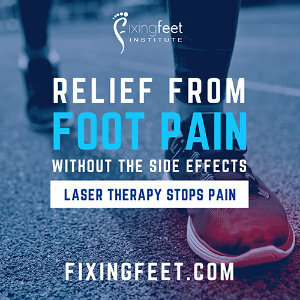 At Fixing Feet Institute, we are pleased to offer laser treatment to relieve pain, reduce inflammation, and promote faster healing when soft tissues have been damaged. Damaged soft tissue is the source of pain for common conditions like Achilles tendinitis and plantar fasciitis. During MLS laser treatment, energy from the concentrated light beams deeply penetrate through layers of body tissue to reach damaged cells in the affected area. Once there, they stimulate natural healing activity within the cells by accelerating their natural growth and reproduction cycles (which happens naturally as your body heals itself). This kind of treatment tends to be most effective for soft tissues—muscles, tendons, and ligaments—all of which are found in great abundance in the lower limbs and often injured in physical activity. The laser is calibrated to produce specific wavelengths of light that are ideal for triggering anti-inflammatory responses. Your body uses these responses to reduce pain and swelling when an injury has been sustained. In addition to calibrating specific wavelengths, we also utilize predetermined pulses, durations, and therapeutic dosages to achieve the results we plan to see. This particular treatment delivers improved circulation, reduced pain, and faster healing, but it is also painless and safe. Lasers used for medical purposes have to be approved by the U.S. FDA – the regulatory agency for ensuring safety of food, drugs, and medical equipment. As if that isn’t enough, there is further good news in the fact this painless therapy has a minimal treatment time. The average session typically takes less than ten minutes. Unlike with pharmacological solutions (medication) for pain, there is no risk for undesirable side effects from laser therapy. If you have an injury or condition that is causing difficulty and pain in your feet, contact our Surprise, AZ office. You may find that our MLS laser treatment will provide the relief you are seeking, so call Fixing Feet Institute at (623) 584-5556 to request your appointment today.